In April 2014 we sent an assortment of instruments including guitars, keyboards, brass and woodwinds, instructional books, strings and reeds to FEPADE, an organisation in DRC that empowers women and children affected by conflict. 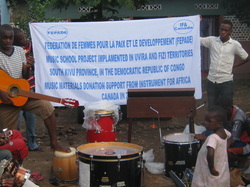 FEPADE operates a music school with several teachers and over sixty students sharing just two guitars and a tambourine. In September 2015 we sent a second shipment of instruments to FEPADE. In June, 2018 we visited the very elegant campus of the long-standing Accra Academy where we met with members of the school brass band. They were very excited to receive a new collection of instruments, including flutes, clarinets, trombones and three great saxophones, along with plenty of extra reeds courtesy of The D'Addario Foundation. In June, 2018 The Accra Girls Senior High School offered their auditorium as a storage and sorting space for our shipment of instruments from Canada and the girls were very helpful helping us unload and organize the instruments. As a reward for all their help, we gave Accra Girls first pick of the instrument groups and we were pleased when they selected a fabulous collection of marching band instruments. In preparation for our trip to Ghana in June, 2018 Instruments For Africa held a special funding drive for the Akropong School For The Blind. In the end we raised enough to purchase 200 brand-new recorders for the school, which we took to Ghana in our checked luggage. Finding we had a little extra space in our luggage we were able to add a keyboard to the donation at the last minute. The kids were very, very excited to receive their new instruments. In June, 2018 we donated a collection of recorders and harmonicas along with plenty of music books to the Bethel Bridge International School, an elementary school in country's capital city. In June, 2018 we donated a box of recorders, a pair of ukuleles a keyboard, and several boxes of music books to Bishop Girls School, an elementary school in Accra. In June, 2018 we met with the director of the national orchestra Isaac Annoh who gave us a tour of their instrument collection. Though it has been well maintained, the twenty or so instruments were very dated, having been donated in 1987. Mr. Annoh told us of his dream to start a National Youth Orchestra, one that would organize and support the most promising students in the Greater Accra area and could be taught and mentored by the current orchestra members, if only he could get some more instruments, including half-sized violins. We were excited to hear his plans and delighted to be able to kickstart the new Youth Orchestra with five half-sized violins and a 'cello, three flutes and a clarinet, a French horn, a trombone, and four trumpets, plus a stack of scores and theory books and a large supply of reeds courtesy of The D'Addario Foundation. In all we almost doubled the orchestra's instrument collection, and shortly after returning to Canada we received word that Ghana's brand-new National Youth Orchestra was set to begin rehearsals on August 4th, 2018. In June 2018 we outfitted Nungua Senior High School with a full marching band, including trumpets, marching drums, and bugles of all sizes. In June, 2018 we donated a collection of stringed instruments to O'Reilly Senior High School, located just east of the capital city of Accra. In addition to several steel and nylon-stringed guitars we added a 12-string and a mandolin along with several electronic tuners and books. In June, 2018 we donated a several electric guitars and amplifiers, a drum kit, an acoustic guitar and several boxes of books and accessories to Our Lady Of Holy Cross School in Kasoa. When we learned that the music teacher was an accomplished violinist we added a pair of violins so he could offer private lessons to some lucky students. In June, 2018 we delivered a collection of violins, books, and extra strings to St. Thomas Aquinas Senior High School. In June, 2018 we donated a collection of acoustic guitars, books, tuners and strings to Tema Secondary School, located an hour east of Accra. In June, 2018 we donated a full concert band to the West Africa Senior High School in Greater Accra. In addition to a wonderful collection of flutes, trombones, French horns, clarinets, and trumpets, we made sure to include plenty of scores and instructional books and a huge supply of reeds that were donated by The D'Addario Foundation. In October 2013 we sent a group of keyboards and several music books to Diyana Combined School for their music club. In partnership with RBC Bluesfest we launched the first international extension of their excellent Be In The Band program in May 2014. In October 2015 we found the program flourishing and donated more instruments. In the summer of 2015 Be In The Band Zambia was invited to perform at the Agricultural and Commercial Show, one of Zambia's largest music festivals. Video of the performance can be found here. In October 2013 Instruments For Africa made a small donation to this Canadian Not-For Profit organisation that focuses on providing schools with educational equipment. Education Without Borders received a digital piano and some keyed accordions. All of Zambia's music teachers receive their training at Evelyn Hone College despite the school's meagre instrument collection that consists of a half-dozen keyboards, a couple of pianos and a set of timpani drums. 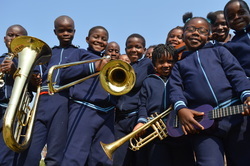 To help Zambia's future educators graduate with more practical experience IFA donated violins, trumpets, clarinets and a trombone to the school in October 2015. 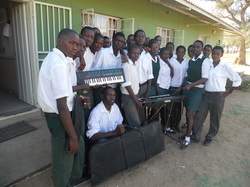 In October 2013 IFA donated a keyboard and a concert band with a full complement of books, accessories, and music stands to Kalomo Secondary School. This is where the Instruments For Africa project began in May 2012 with the donation of a single acoustic guitar, a handwritten instruction book, three sets of extra strings and a few picks. 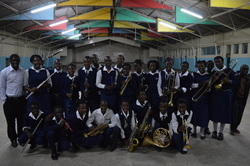 When IFA returned in 2013 we reserved the biggest collection of concert band instruments for Linda Secondary School, and we included several more guitars, an electric bass, amplifiers, a keyboard, boxes of accessories and many, many music books and scores. In October 2013 IFA donated a large concert band, boxes of accessories like reeds, tuners, metronomes, cleaning kits, and valve oil, a drum kit, electric guitar and amplifier, and lots of books and teaching materials to this large school in the Longacres district of Lusaka. In September 2015 we added a few more instruments to their collection, filling out the brass section with a pair of trumpets, a trombone and a euphonium. In September 2013 the Instruments For Africa team was impressed with a performance by the Lusaka Youth Orchestra under the tutelage of Michael Themba, who also runs the Kanyama Youth Choir and Orchestra. While we found the LYO to be fairly well equipped IFA was happy to donate a very nice four-piece recorder set. In May 2014 we added a small number of brass instruments to be shared between both orchestras. In October 2013 IFA donated a guitar group, several violins and a keyboard, a box of extra strings, instruction books and picks to Monze Boarding School. This secondary school has two streams of students attending classes every day so these instrument can be enjoyed by twice as many kids. In October 2013 IFA donated a keyboard and a recorder group along with ample books and teaching materials to Monze Primary School Monze Primary is the proud home to Zambia's champion majorette group and they are happy to begin supplying their own music to the majorette routines. In 2013 Mukuni Basic School started a music room for extracurricular activities. In October of that year IFA found the music room to be almost empty so this beautiful set of hand-crafted Irish whistles were donated to the school. Curiously, there is a Irish and tin whistle tradition called kwela that originated in southern Africa so the kids have an opportunity to create local music on these at-first-glance foreign instruments. This small but impressive private music school is a beehive of musical activity. In addition to establishing the busiest music academy in the country, owner Paul Kelly organizes Zambia's only classical music festival, presenting musicians from all over the world to growing crowds each year. In October 2015 IFA donated a few specialty instruments to the academy, including a bass clarinet, an oboe and a flugelhorn. 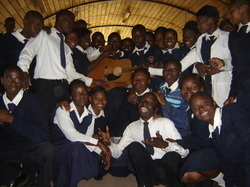 In October 2013 Instruments For Africa donated a keyboard and a guitar group with a wealth of books, picks, and extra guitar strings to this school on the outskirts of Lusaka. 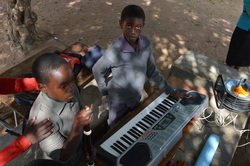 In 2015 we donated another two keyboards and a collection of thirty recorders to the school. While Roma Girls School was not operating an official music program we found the school did have a very active music club. In October 2013 IFA donated a keyboard and a recorder group with music books to this energetic group. Shortly after this school was built in 1965 the St. John's Secondary School Brass Band was established and it remains the only brass band in the sprawling province. When we arrived in October 2015 we found the band's equipment to be in remarkably poor shape. The band practises daily despite having instruments that are barely playable. IFA left them with a 24 instruments including some very sought-after reeds courtesy of The D'Addario Foundation. In October 2013 we donated a ukulele group, extra strings, a stack of music books and a keyboard to this school that was built entirely by a Canadian charity called Friends For Zambia. In 2014 we added three more ukuleles and a recorder group. In 2015 Twitti upgraded to a small orchestra, with trumpets, violins, violas, flutes, clarinets and more. 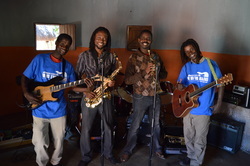 Visit www.friendsforzambia.org to find out more about this great organization. 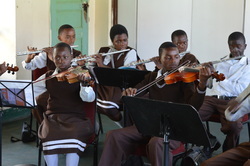 Zambezi Primary received a concert band, violins, viola and double bass, a keyboard, and stacks of music books and scores from IFA in October 2013. In September 2015 the school received another sizeable donation, including a 'cello to complete their string quartet.